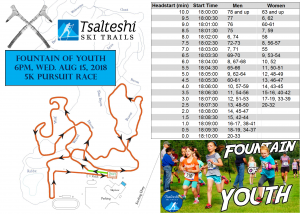 Essentially a sixth Salmon Run, this 5k, pursuit-style race follows previous years’ format with head starts based on your age and gender. That means anybody could win! To get your head start you MUST register online. Race-day registrants will start in the LAST wave.